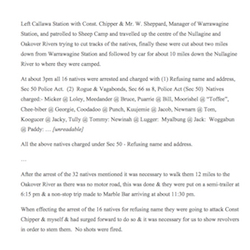 McLeod referred to this in a letter to Minister for Native Affairs Ross McDonald. Thank you for your letter of 14th March. I am sorry I had not the opportunity to meet you when you were passing through the district some time ago for considering remarks passed by the Premier Mr McLarty during his visit I think it would have been of considerable advantage both for the natives and the administration if this had occurred. You will understand that I am merely the medium through which the native people around here transmit their views the remarks [about?] 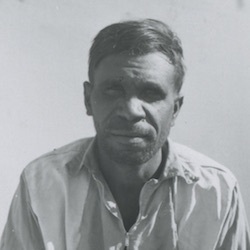 the probable unconstitutionality of the act refers to lawyer F Currans visit to Pt Hedland during June 46 at which time he argued to this effect in the Port Hedland courthouse in the presence of a large number of natives. I have indeavoured to explain to them that although this matter was not argued before the High Court it does not effect the quality of the act but it is difficult to convince them and indeed I have to admit that I myself still have a doubt in my own mind on the matter and may not have carried conviction to them for that reason. I will be more than pleased when the time arrives that I myself the Department and the government can cooperate in measures for the progressive improvement of the opportunities and conditions of our native peoples. This is something for which I have hoped for for a very long time and you may be assured that it will not be because of any unwillingness on my part. I can appreciate how difficult it must be for one situated a thousand miles from here and having only reports to go on to arrive at a sound conclusion particularly when those whose duty it is to present reports have an axe to grind and are not wholly controlled by the Dept. I have often thought what a difference it should make if you or someone in whom you have confidence could sit in incognito and watch the travesty of justice which takes places at various hearings up here when the evidence is manufactured on which the enumerable natives have been convicted during the last three years and also in previous times to a lesser extent or to a meeting of Pastoralists where the native question comes up for discussion. if you had any previous doubts such an experience would convince you in whose interests the natives have been administered. The greatest obstacle to the progressive improvement of opportunities and conditions of our native population lies in the minds of those whose duty it is to carry out the policy decided upon by yourself and your departmental advisors and while they persist in the present negative attitude and the obvious belief that because the native has [unfortunately?] been born black he is mentally deficient and devoid of the normal processes of thought so long with the sum of money large or small set aside for the Dept be wasted. I have at all times endeavoured to inculcate in the minds of the native peoples the belief that any improvement in their conditions must come by constitutional means that they are best advised to be orderly industrious and clean and so show by example that they are entitled to better treatment that no one cares to have a pistol held to his head and have demands made on him in this fashion particularly people in charge of Departments of State and to an extent I have been successful in this. But the continued example of the police their protectors slandering them in court in order to secure a conviction at the same time protesting he has the welfare of the natives at heart has gone far to discredit this view as does the continued disruption to their various work parties consequent on various of their members being husselled off to goal to await trial for trifling offences. This has culminated in a situation in which we now see these people having lost patience at these continued provocations and seeing no improvement in their affairs brought about by their being law abiding and helpful passing over my advice and deciding on direct action. Such situations are not helped by Bligh and others threatening to shoot them indeed if such threats are continued with a tragedy will eventually occur I myself could feel the effect when word was passed around by Joe that Bligh had made this threat immediately after the last case its effect was electrical and it was fortunate indeed that I happened to be present when the disclosure was made or we would have had an inquest by this time. In conclusion I would plead with you that it would take so little to solve the so called native problem so far as this district is concerned and I cannot speak of other parts with knowledge I would suggest that local protectors be given specific instructions to carry out the instructions contained in your regulations that is to get to know their charges personally to take a friendly interest in their welfare and endeavour to protect them from injustice imposition and fraud. P.S. 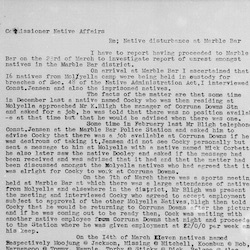 It would be interesting to hear what useful purpose Inspector L O’Neil hoped to achieve by his light hearted threat that any further action would result in the goaling of those involved and his confirmation in the same jovial manner when Dooley accepted the dare on behalf of a hundred or several hundred of his friends. Not only will it not profit the Dept to have several hundred men in goal but this action will obviously snowball until every native in the district becomes involved. Such an action will give those with conflicting views the opportunity to be heard where any misstatements or deliberate inaccuracies could be immediately corrected or refuted and probably a satisfactory solution evolved. Don McLeod to Ross McDonald, 6 April 1949, SROWA, 1943/0621/127-30. 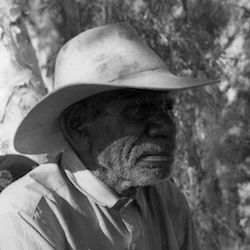 The strikers’ campaign to fill the jails took place in 1949, following the imprisonment of ten men for removing a worker, Cocky Brown, from Corunna Downs Station. 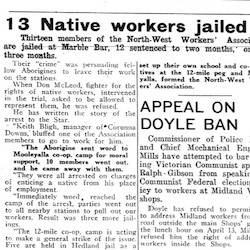 In protest, and to demonstrate their refusal to be cowed by O’Neill’s threat, parties of strikers began travelling out to stations to bring more workers into the strike. By April, 43 men had been imprisoned.